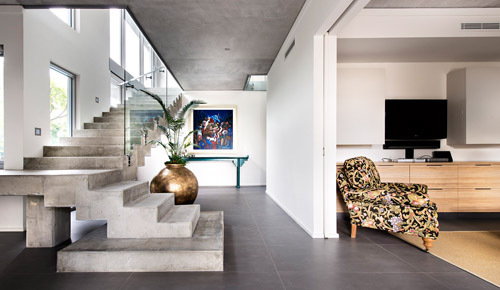 "I'm not afraid to throw away a good idea, it may reveal a better one"
D4 Designs is a multi-award winning building design practice in WA, specializing in individual luxury residences. Director Douglas Paton lives & breathes his passion for Architecture, providing clients with design solutions rivaling Perths leading residential architects. "Once we decided to build for the second time, we had no hesitation again in engaging Douglas Paton of D4 Residential and Commercial Design. The effort put in, attention to detail (at every stage) and therefore the quality he produced was nothing short of spectacular. What really impressed us was Doug's ability and willingness to push the boundaries and think outside the square and not just take the easy route and churn out a design which is the easiest path, this was particularly important when dealing with two narrow blocks where space was at an absolute premium." "Doug has the uncanny ability to grasp what you’re looking for in the first meeting then visualise and create extra space out of nowhere. Every time we’re confronted with an unsurmountable problem; we’d call Doug and ask him to “do magic”. We wasted a lot of time and money shopping around and were told by other designers and/builders that it's simply not possible due to the small size of the block. This is the fourth home we’ve built and we have to say that it is indeed the first time we’re especially very happy with the outcome and will not hesitate to engage him in future or recommend him to anyone who's looking to build an 'amazing home!" "Doug possesses a great natural sense of balance between practical design and aesthetics, stretching the boundaries without compromising buildability. A pragmatic approach that is rare and refreshing, Doug incorporates practical design elements, utilising his vast knowledge of building codes and regulations, the consequence of which manifests itself in concise working plans and functional schedules. A consumate professional with excellent communication skills, a great sense of humour and a good listener."